This is a full hull 1/350 scale resin kit by Combrig Models. SMS Viribus Unitis was the first Austro-Hungarian dreadnought battleship of the Tegetthoff class. Its name, meaning "With United Forces", was the personal motto of Emperor Franz Joseph I.
Viribus Unitis was ordered by the Austro-Hungarian navy in 1908. As the first of the newly created Tegetthoff-class battleships, she was laid down in Stabilimento Tecnico Triestino shipyard in Trieste on 24 July 1910. 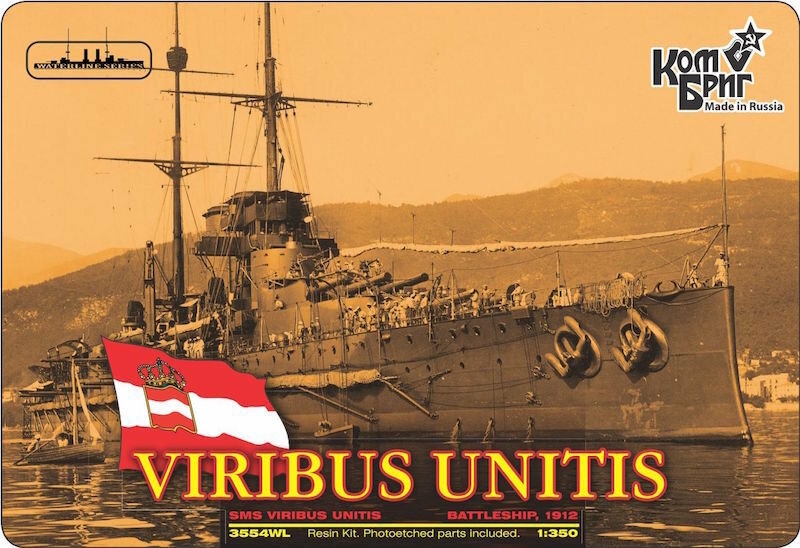 Viribus Unitis was launched from the shipyard on 24 June 1911 and was later formally commissioned into the Austro-Hungarian Navy on 5 December 1912. During World War I, Viribus Unitis took part in the flight of the German warships SMS Goeben and Breslau. In May 1915, she also took part in the bombardment of the Italian port city of Ancona. Viribus Unitis was sunk by a limpet mine planted by frogmen of the Italian Regia Marina on 1 November 1918.